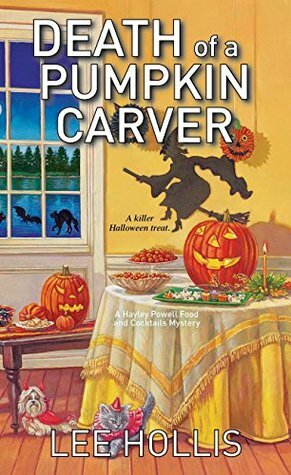 The latest in this cozy mystery series, Death of a Pumpkin Carver is a wonderfully fast and enjoyable read. Hayley Powell is at is again as the town sleuth while she uncovers a sinister conspiracy afoot. When stacked up to the other books I’ve read of this series, this book, although still a great read, paled in comparison. To me, there just seemed to be a lot of filler and slow build-up to a mystery that was so easily and quickly solved. I was also a bit dismayed to find it didn’t contain as many humorous moments as the previous books. I very much enjoyed the concept of the mystery and how the ultimately fit together. Although it was lovely being reunited with some reoccurring characters, such as Hayley’s friends, I would have loved them to appear more in the book. Getting to know Hayley’s ex-husband was a hoot! I loved Danny’s characterization as it displayed his appealing qualities and many flaws, and how he and Hayley bounced off of each other. In all, although it doesn’t feel as developed as the previous books in the series, Death of a Pumpkin Carver was still a great fast read and a wonderful cozy mystery to relax with on a lazy weekend. I look forward to the next book!